Generally conceded to be doomed from the outset by the most recent historiography, the Gallipoli campaign still arouses heated controversy. 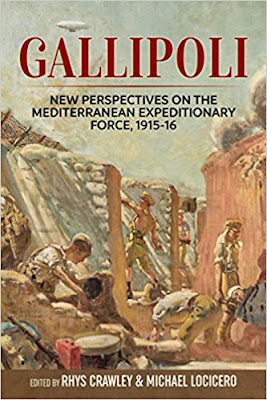 In a new compendium of original research by an impressive array of established and up and coming scholars, Gallipoli: The Mediterranean Expeditionary Force 1915-16 explores various aspects of the Allied military effort to force a passage through the Dardanelles Straits and eliminate Ottoman Turkey from its Central Powers alliance. Contributors and topics: Phylomena Badsey: Care Giving and Naval Nurses; John Bourne: 7th North Staffordshire Regiment; Stephen Chambers: MEF POWs; Alexandra Churchill: The Evacuation; Jeff Cleverly: Suvla Bay Landings; Rhys Crawley: Mediterranean Expeditionary Force Headquarters; Brian Curragh: Lieutenant-General Sir Bryan Mahon and 10th (Irish) Division; Peter Doyle: Gallipoli terrain; Katherine Swinfen Eady: 29th Division staff officer; Mel Hampton: First Battle of Krithia; Peter Hart: Royal Naval Division; Simon House: Corps Expeditionnaire d'Orient; Gavin Hughes: Irish Regiments; James Peter Hurst: ANZAC landing; Rob Langham: Highland Mountain Brigade; Michael LoCicero: Krithia Nullah operations November-December 1915; Linda Parker: British and Australian Chaplains; Ross Mahoney: British airpower; Simon Peaple: Grand Strategy; Chris Pugsley: New Zealand military performance; David Raw: Hunter-Weston-Egerton feud; Chris Roberts: Australian Brigade Command;; Rob Stevenson: 1st Australian Division; Tom Williams: Territorial divisions at Suvla Bay and Ritchie Wood & John Dixon: British and Australian Tunnellers.